Find the answer below or contact us and we’ll be happy to answer any questions you have. Your bike, a helmet, cycling clothing, a bottle of water, repair kit, cycling snacks for along the way, and a great attitude. You’ll leave with a smile. Once you sign up for a tour, we’ll send you a detailed list of suggested items to bring. We strongly recommend cycling clothing such as shoes, shorts, gloves, and a helmet (helmets are mandatory in British Columbia). We recommend you bring your own bike but if you prefer to rent, we have a wide variety of bikes you can be fitted for. Rent a bike here or contact us for more info. If you wish to bring your own saddle and pedals, please let us know in advance so the rental shop can accommodate. The rental shop also has helmets available. Helmets are a requirement in the province of British Columbia and must be worn at all times when cycling. How many people per tour? We have a minimum of 4 guests per ride. Most tours have a maximum of 12 guests with a tour leader. We run groups of 18-24 people, and support leaders are added as needed to ensure you’re well taken care of. Our rides are for intermediate to seasoned riders who want to enjoy the bounty and scenery of our beautiful Okanagan valley. They are not for novice or beginner riders. Please pick which tour you feel is the right fit for you. Epic Explorer Ride: 23-28 km/hour with an optional coffee stop. The perfect ride for those who like to go further at a slightly faster pace while still enjoying the views and the pleasure of cycling. Epic Road Ride: 26-32 km/hour with hills. For the serious cyclist who likes a good challenge. Great for those who want to go the distance and tackle the South Okanagan’s challenging hills. Custom rides. Want to do some hill training? Have a celebration or a corporate event? We’ll set it up for you. We can customize all aspects of your ride from date, duration, route, wineries – even multi-day tours. I live to ride - my partner does not. What are our options? Your non-riding partner can join in the fun by meeting us at the vineyard after the ride. What’s included in a ride? A guided ride with experienced leaders. Food and wine samplings, a support vehicle with water and snacks and an Epic Cycling water bottle. Each ride varies. Once you book, we’ll provide you with a full itinerary of time, meeting place, wineries and ride route. What if I need to cancel my tour? Tours and rentals cancelled before 4pm, ten (10) days prior to the date of the tour will be fully refundable. Cancellations are accepted by telephone or email. No-shows or late arrivals are non-refundable. A re-booking fee of $25.00 per person will apply if your tour is changed, transferred or re-scheduled within ten (10) days prior to departure. If your group is not at the agreed pick-up location on time, you may miss your tour and no refund will be given. If you’re late, please call us at 604-626-5167 and let us know. A re-booking charge of $25.00 will apply if you need to reschedule or cancel your tour. What's the code of conduct? You can check out our Code of Conduct here. It’s all common sense but important to note before you join a ride. Each individual is responsible for her or his own safety. You should recognize that riding a bike on public roads can be hazardous and you must prepare adequately. You must wear a HELMET. It’s up to you to carry enough food and drink, clothing, medical supplies, repair kit, cell phone and anything else you may need to keep you safe. Please pay online, or if you are a last minute add-in, we can process your payment on site. All prices are in Canadian dollars and we accept all major credit cards when booking or immediately prior to departure. What if I have a large group? You need our Custom Ride. We can customize date, route, ride duration, level, and wineries for your group. Gratuities are not included in our rides but are graciously accepted by our guides directly. Gratuities in Canada are typically 10-20% based on your level of satisfaction. Wineries will change depending on the ride route, date and weather. We’ll arrange everything in advance and email you with all the details once you book. Can we request specific wineries? We carefully select the wineries for each ride. For the Epic Explorer or Epic Road Ride, you cannot request specific vineyards. However, our Custom Rides are catered to your preference. If you’re one of our returning guests and have a vineyard in mind, or you want to try a new winery, this ride may be a good option for you. Yes! The wineries we visit have many fine wines that are available for purchase, making it an extra special experience! These wines can be transported back to the starting point for your convenience. Obviously, these purchases are not included in your tour rate. I have dietary restrictions. Can this be accommodated? Please let us know in advance so we can make our best effort to accommodate you. Due to the nature of the tours, not all dietary requirements can be allowed for at all stops but we’ll do our best. 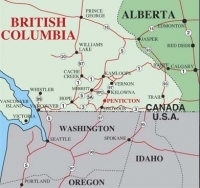 You can find us in beautiful Penticton, British Columbia, Canada. Penticton is a semi-arid climate with low precipitation, hot summer days, with cool nights and low annual precipitation. Penticton is the 4th driest city in Canada.